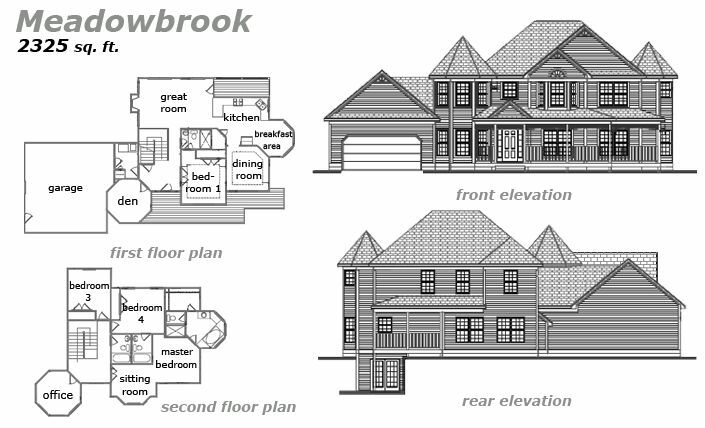 Meadowbrook – 2325 sq. ft.
An absolutely stunning mansion with 4 Bedrooms, 4 Bathrooms and a unique aesthetic that looks right out of the pages of a book! The kitchen ajoins a breakfast area and private dining room with lots of natural light. There’s a bedrom on the first floor as well as a den. On the second floor, we have the remaining 3 bedrooms, including a master bedroom suite with private bathroom. There’s also a sitting room and an office, again bathed with natural light from the large windows! Jeda Homes is a professional builder that would love to turn this home into a reality for you. Our Design Specialist works with you through the planning phase, and we keep you informed about every aspect of the construction phase. You’ll know exactly what goes into your house and will feel comfortable with your decision to choose Jeda Homes as your builder! Contact Jeda Homes today, there’s never been a better time to build!